In schools, we’ve all learned Newton’s laws as some blatant fact about our universe. I too made a video that celebrates them and presents them as an obvious truth. What are the laws, again? Hummm… You know what? Let’s just listen to Derek Müller on Veritasium instead. His fantastic video below points out the misconceptions of our intuitions. Hummm… That’s messed up. Are Derek’s laws really incorrect? They are. Derek’s laws are both very intuitive and fundamentally incorrect. Conversely, Newton’s laws are both very counter-intuitive and much more correct. But, wait, didn’t Einstein prove Newton wrong? He did. But Newton’s laws are still amazingly fit to describe virtually all mechanical motions we are familiar with, from the falling of an apple to the orbits of the planets of the Solar system. From our daily lives to rocket science, at our macroscopic scale and in our time scale, Newton’s laws are so extremely accurate that it’d be pointless to replace them by Einstein’s relativity. Indeed, the predictions of the two theories would coincide nearly perfectly. So, if I follow you, Newton’s laws are simpler approximations of Einstein’s more exact ones? Yes. And yet, as Derek just showed you, they are already unbelievably counter-intuitive. Let’s review them in details! Derek’s videos are brilliant because they help us realize what mistakes our intuitions make. This is an essential step in learning that is too often missing! Indeed, because our intuitions are often wrong, it’s very important to know when and why, if we ever want to have solid bases to truly grasp the world around us. Here’s a blog post where I detail why I think that. Following Derek’s discoveries, I will not attempt a clean, well-explained and easy-to-read introduction to Newton’s laws. Instead, this article will dive into all the things that go wrong with our intuitions when we first learn Newton’s laws. It’s a rougher journey, but I guarantee that it’s a rewarding one, even if you already know Newton’s laws! Intuitively, all objects in motion will exhaust and slow down. After all, it takes energy to get in motion, whether this energy is the burning of calories or the that of fuel. And when this energy dries out, obviously, the object cannot move anymore. There are so many examples of that! Kick a ball, drive a car or look at Usain Bolt. Every unperturbed object in motion seems doomed to end up still. It sounds clearly true, right? How can it not be right? The answer is literally in the sky. On earth, there’ll always be something to perturb the motion of an object. The ball may be stopped by a net, the car may crash on a wall, and Usain Bolt may use frictions with air and the ground to slow down. However, up there, through the void of the cosmos, little can perturb the motions of astronomical objects. And thus, if we really want to understand the nature of unperturbed motions, it’s only by looking up there that we can find an answer. This is what Galileo did and, more importantly, this is what Newton did. They found out that, up there, moving objects do not seem to slow down. What’s very troubling with Newton’s first law is that it never applies! Crucially, in real life, no object is unperturbed. Even astronomical objects up there are under gravitational influences. This is why this first law is so counter-intuitive. It is an abstract principle that makes the whole theory consistent. Yet, it never applies to reality. When you ponder this, it’s even hard to imagine that the law of inertia is regarded as the first and most basic law of all physics! After all, it’s hardly testable! Technically, Newton’s first law is pretty useless, as it can be regarded as a mere particular case of the second law! Nevertheless, it is an interesting first step to dive into Newton’s picture the world. And it unveils in quite an obvious way just how counter-intuitive the laws are. In fact, the effort to make sense of it is pretty enlightening. How can I make sense of this first law? Imagine you were served coffee on a plane. Coffee falls downwards, yet the plane is flying at high speed horizontally. Do you think that the air hostess would aim ahead of the cup to pour coffee? Would she pour it like on the left of the figure below, or like on the right? Galileo did himself this thought experiment (with a ship instead of a plane). Amazingly, he concluded that, if the motion of the plane was constant, then the left solution was the right one. More generally, the laws of physics should not be modified within a system in constant motion. The physics in the plane shall be exactly the same as the physics on Earth. This idea is known as the principle of relativity. And this mere principle of relativity suffices to derive Newton’s first law. The key is to remark that motion is relative. The coffee cup is still with respect to the air hostess. And yet, it is moving at very high speed with respect to the peasant looking up at the plane from his fields. Amazingly, the obvious fact that, if unperturbed, the coffee cup will indefinitely remains still with respect to the air hostess also implies that it will keep its very high speed with respect to the peasant. That’s why, from the peasant perspective, unperturbed objects will preserve their motions indefinitely. The most fundamental law of Newton’s laws is the second law. It is by far the weirdest of all. That’s partly because it involves three concepts which are all trickier than they sound. First is the concept of force. What do you think that is? Isn’t it the power we give to an object we want to move? Hummm… The trouble is that the word power means something else in physics. Power corresponds to the amount of energy we transfer to the object, or that the object transfers to us. Let’s take the example of a goalkeeper catching ball. By applying a force on the ball, the goalkeeper is actually retrieving kinetic energy from the ball. So, weirdly enough, in many cases, applying a force may correspond to the opposite of giving power to an object! Similarly, when you’re holding a heavy rock in your hands, you are applying a big force to the rock to keep it from falling. Yet, you’re transferring no energy to it! So, weirdly enough, a strong force may have no power. The Wikipedia definition says that it’s what influences the motion of objects… but this boils down to saying that force is defined by Newton’s second law! That’s not what we want, as it’s supposed to be used to define Newton’s second law. In other words, Wikipedia definitions yield a troubling circular definition of forces and Newton’s second laws. That’s how weird and counter-intuitive the mere concept of force is! I’m not criticizing Wikipedia at all here. It’s simpler and more useful to present forces and Newton’s laws through this circular definition. It’s definitely flawed though, and a deep understanding of Newton’s laws require us to go deeper. Can you give a definition of what forces are? Here’s a link towards the follow-up video on all forces acting on you. So, according to Derek, a force is a push or a pull. This push or pull is characterized by a direction and a value. For instance, the gravity force of a planet pulls an object towards the center of the planet with a value proportional to the mass of the planet, propotional to the mass of the object and inversely proportional to the square of the distance between the planet and the object centers of mass. This is what Newton must have thought. So he reused René Descartes’ algebraic geometry to sum up all the information about a force into a single mathematical object called vector. This vector has two representations. One is geometrical: A force is an arrow determined by a direction and a length. The other is algebraic: A force is a collection of 3 values of the force. Each value stands for the strength of the force in one of the 3 spatial directions. Accordingly to Descartes’ dictionary, there’s a natural translation between these two representations of vectors. Namely, the three algebraic values of a force are the coordinates of the geometric arrow. Here’s an example in dimension 2. To compute the strength of a force from its coordinates, you only need to apply Pythagorus theorem! For more detail on vectors, check my article on linear algebra. OK… I guess I get what forces are. What’s the second of the concepts you were talking about? What about mass? That’s a well-defined concept, isn’t it? The trouble with the idea of mass, is that it’s both related to inertia and weight. And yet, a priori, there’s no reason why heavy objects should have greater inertias! This is why physicists have long distinguished inertial mass from gravitational mass. The former is the one we’re interested in right now, while the latter is the one that intervenes in the law of gravity. In Newton’s laws though, inertial and gravitational masses are suspiciously the same. This is very puzzling. Centuries later, this weird puzzle led Einstein to state the equivalence principle between acceleration and gravity, as he invented general relativity. So how would you define inertial mass? Once again, I’ll just steal Derek’s words. Inertial mass is just a measure of the amount of matter in an object. If you want to know more, Derek has a great video about what the unit of the inertial mass (the kilogram) is. Interestingly, it used to be defined accordingly to gravitational mass, but this may soon change! Using Lavoisier’s research, it may turn into something much closer to Derek’s definition, that is, something that measures the “amount of matter”. OK… What’s the third concept? Click here to see Derek’s answers: a, b, c, d, e.
As it turns out, the right answer is d, where, according to Derek, the acceleration is twice that of a. It’s very counter-intuitive because we tend to confuse acceleration and speed. Importantly, acceleration is not speed nor velocity. An object may have a strong acceleration while barely moving at all. It’s the direction and value at which motion changes. At the bottom of the jump, the motion of the jumper completely changes. He was going down quickly, and next thing he knows, he’s going up quickly too. By opposition, at his maximal speed, the jumper’s motion doesn’t change at all. He just keeps going down at the same maximal speed. 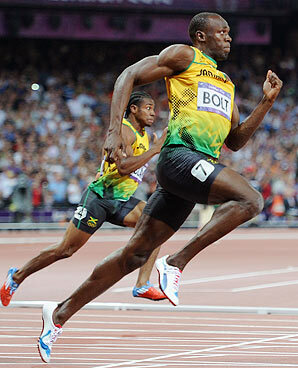 The right definition of acceleration requires the language of calculus that Newton invented himself for that purpose. You can learn more with my article on differential calculus. Does that mean that acceleration is about how speed changes? No. Acceleration is not the change in speed. It is the change in motion. Take the example of the Moon. The Moon is constantly accelerating towards the Earth. And yet, its speed remains constant. But, crucially, its motion doesn’t. At any time, its motion gets curved towards the Earth, because it accelerates towards the Earth. So the direction of acceleration is just as important as its value, right? Exactly. That’s why, just like forces, accelerations are vectors. An acceleration is thus geometrically represented by an arrow, and analytically by three coordinates. Better than that. 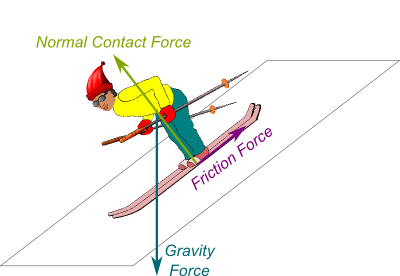 Newton’s second law asserts that the forces on an object are what determine its acceleration. In other words, the acceleration of an object is an arrow which has the same direction as the sum of the forces acting upon it. So, for instance, the Moon accelerates towards the Earth, because the force of gravity pulls it towards the Earth. What about the strength of the force? Is it related to the value of the acceleration? By dividing both sides by the inertial mass $m$, we get the more intuitive formula $\vec a = \vec F/m$, which says that acceleration has the same direction as the forces, that its value is proportional to to the strength of the force divided by the inertial mass. At first glance, this formula should look like a mermaid driving us away from Truth because of its misleading elegancy. How could physics be reduced to such a simple equation? Plus, why is acceleration involved? Is it not the motion that we affect, rather than the change in motion? Our intuitions say that if we want to get up, then we can get up. If we want to get going, then we get going. In other words, our intuitions say that we control our motion and the motions of the objects around us. And in most video games, that’s what we do. We control the motions of our heroes. Is that not the case in real life? Crucially, according to Newton’s second law, the answer is no. Our intuitions are fundamentally mistaken. We cannot control motions directly. At best, we control the changes in motions! To fully grasp, seize and feel Newton’s second law, I suggest you ponder that sentence longly. So how can it be? Why does Newton’s second law hold? I don’t know! But it’s been tested over and over, and has given so many right predictions. This law is still the one we use to send rockets in orbits or to design powerful mechanical machines. It is accepted by all, because careful experiments have shown that it was trustworthy. However unlikely that may sound. After all, it’s puzzling to wonder how Newton ever managed to convince others of the accuracy of his second law. To answer that, I’d have to tell you about gravity and conic sections, which I did here! So, as it turns, you are pulling the Earth just as much the Earth is pulling you. Yet, I don’t affect the motion of the Earth, do I? You do a little bit. 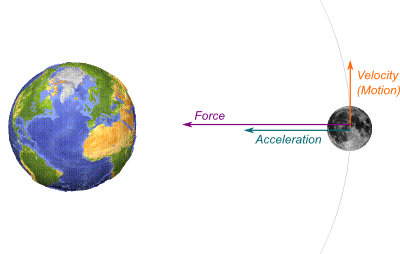 But the Earth has such a huge inertial mass that, to make it accelerate, it takes a much much bigger force than the force it exerts on you. Keep that in mind. Big forces applied to enormous inertial masses induce little accelerations, as asserted by the second law. So how can we understand this third law? Let’s see one essential application of this third law which will help us understand it: Rocket science. Well, actually, let’s see Derek explain rocket science to us! So how do we control the motion of a rocket? Derek’s explanation of rocket science lies in the the third law. While the rocket pushes away its propellant, by the third law, the propellant pushes back the rocket with an equal and opposite force. But it’s not intuitive that the two forces will be equal, is it? It’s not. Intuitively, I guess that most people would say that the force of the rocket on its propellant is much greater than the force of the propellant on the rocket. So how should we think intuitively of this third law? As I said, the third law can be derived from the additivity of the second law. Consider the rocket and its propellant as a whole system. Assume that there is no external force acting on them, as they are traveling in outer space. Then, by the first law, the system as a whole should maintain its motion indefinitely. Now, if we look at the details of all forces, then the total force on the system must also include internal forces. Namely, we should include the force of the rocket on the propellant and the force of the propellant on the rocket. But since the system as whole maintains its motion indefinitely, this also means that the sum of all forces is zero. Hence, the force of the rocket on the propellant and the force of the propellant on the rocket must add up to zero. In other words, each one is necessarily equal and opposite to the other! The key concept to fully grasp this third law is to reason in terms of momenta. In French, momentum is translated into “quantity of motion” and I think it’s a very good way to put it. A momentum represents how much and how fast a motion is. A massive object moving slow may thus have as much momentum as a smaller object moving very fast. Newton’s second law then says that the variations of a momentum is determined by forces. Combining this with Newton’s third law implies that systems with no external force applied to conserve their momenta. This is a useful thing to keep in mind to figure out this experiment by Derek. In conclusion, I should say that there actually is only one law: The second law. In total generality, this second law asserts that for any collection of matter, the sum of all external forces acting on it divided by its total inertial mass must equal the acceleration of its center of mass. From this law, all other laws can be derived! When you think about it, it’s completely astonishing that this single law governs nearly perfectly most of the physics we know. In this powerful, predictive and elegant law lies the beauty and conclusiveness of Newton’s laws. Even though these are highly counter-intuitive. Was it necessary to insist so much on how counter-intuitive these laws are? Understanding our misconceptions is crucial. Personally, even in my mathematical research, I deal with concepts about which I’ve made up diverse wrong intuitions. The point is not always to erase these intuitions, but, rather, to know their limits so that I can know to which point I can trust them. Finding out these limits can also help me nurture new better intuitions about concepts I’m dealing with. Interestingly, the same holds for theories of physics. We now know quite accurately the limits of Newton’s laws of motions, and this has helped us (by us I mean Einstein!) come up with new better theories! Newton's Laws on the Physics Classroom. Newton's Laws of Motion on NASA. Newton's Laws of Motion on Physics 4 Kids. Newton's Laws of Motion on Live Science.